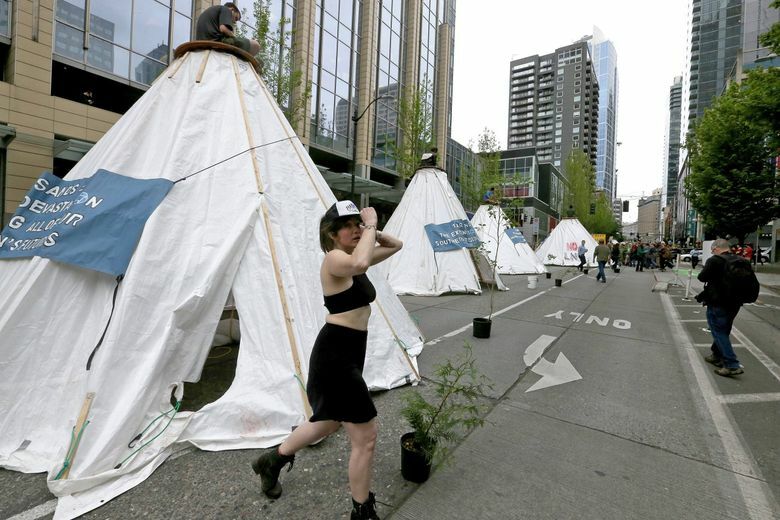 Opponents of the proposed cross-Canada pipeline expansion blocked traffic with teepees and also occupied the lobby of an office building. 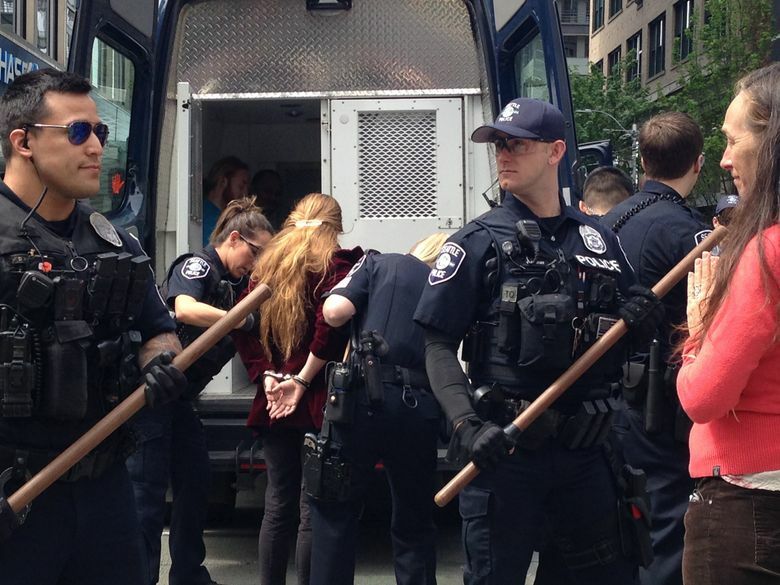 About a dozen people later were arrested after police asked them to leave and they refused. Police diverted traffic around the area. Interim Police Chief Carmen Best was present, and protesters were eventually told to disperse or face arrest. 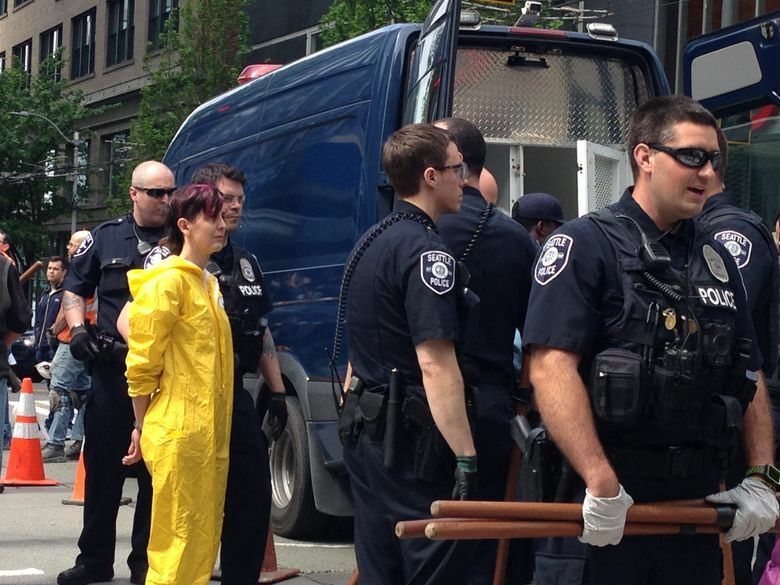 About a dozen remained in the street, and they were peacefully placed in restraints and loaded onto a police van. The pipeline project — an expansion of an existing pipeline — would run from Alberta to British Columbia, where its oil would be loaded onto tankers that would travel the Strait of Juan de Fuca, tripling traffic and potentially endangering the already dwindling Southern Resident orca pod. 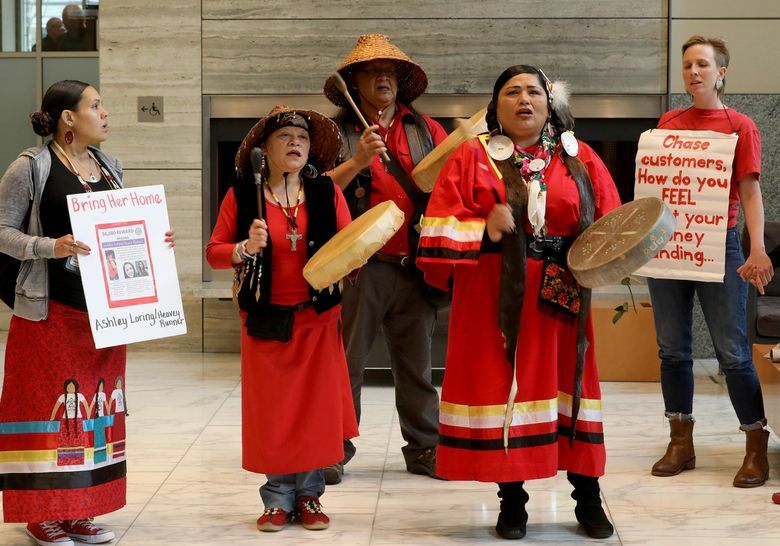 Opposition to the expansion has been fierce, and the provincial government in British Columbia, as well as a number of First Nations leaders have opposed it. 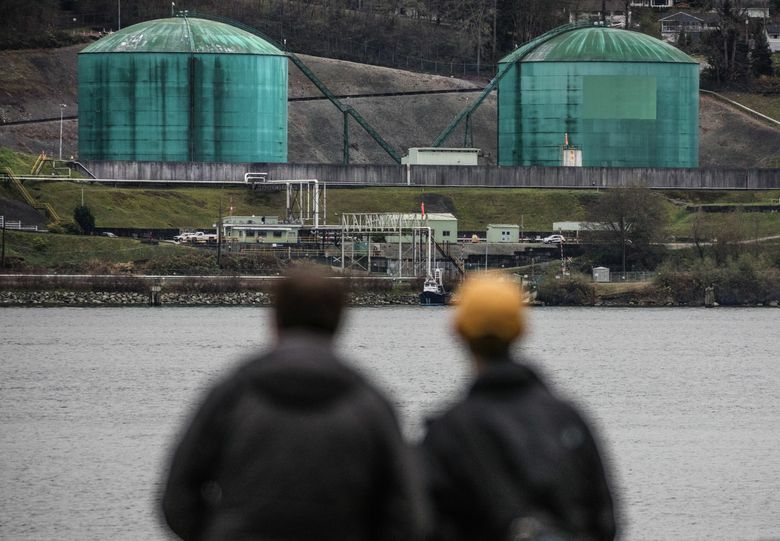 Developer Kinder Morgan curtailed spending on the $7.4 billion expansion in April, blaming opposition and delays in B.C., and setting a May 31 deadline for the federal and provincial governments to find a solution or risk the loss of the entire project. 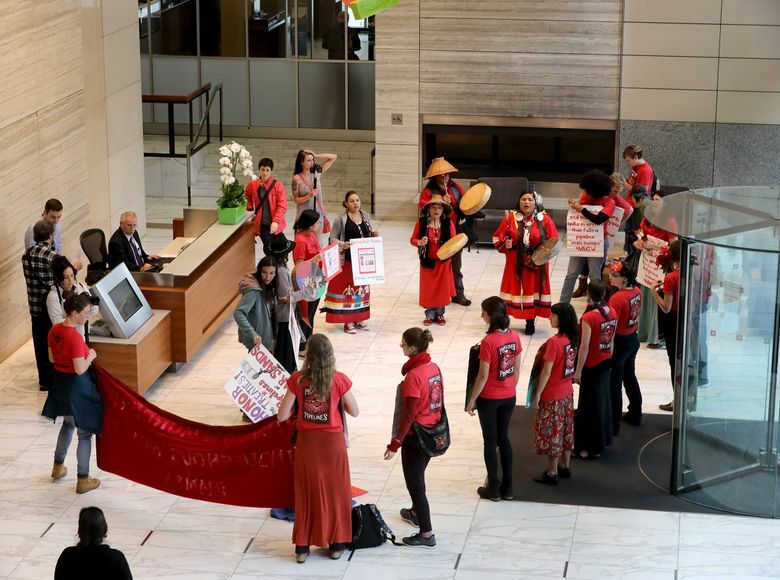 More than 25 women holding red roses drummed and sang in the lobby of the Russell Investments Center, calling attention to missing and murdered indigenous women, and saying that men who moved to rural areas to construct pipelines contributed to violence against indigenous women. 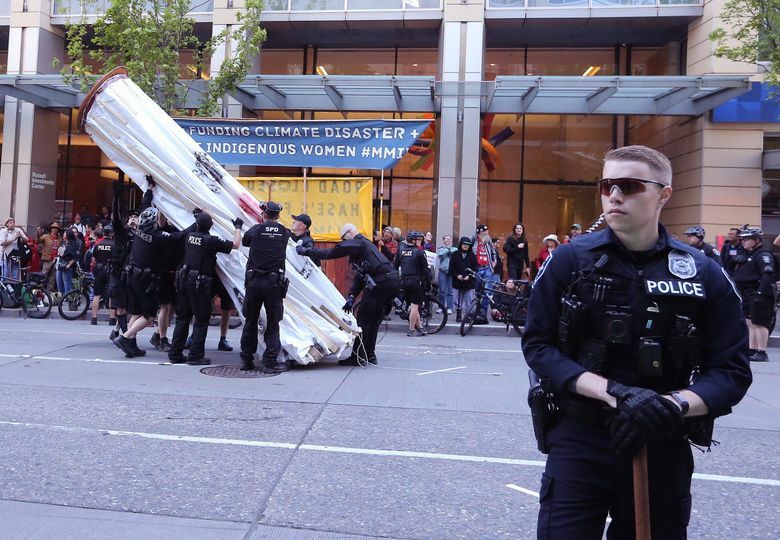 As they filled the lobby with drums and song, demonstrators sat atop teepees in the middle of Second Avenue burning sage as speakers took turns speaking out against the pipeline. Dressed as the Lorax, some shouted, “Unless someone like you cares a whole awful lot, it’s not going to get better. It’s not,” the closing line of the book “The Lorax” by Dr. Seuss. Danny Lange, 23, of Seattle was among four demonstrators perched on platforms atop teepees who refused to obey the commands to disperse. 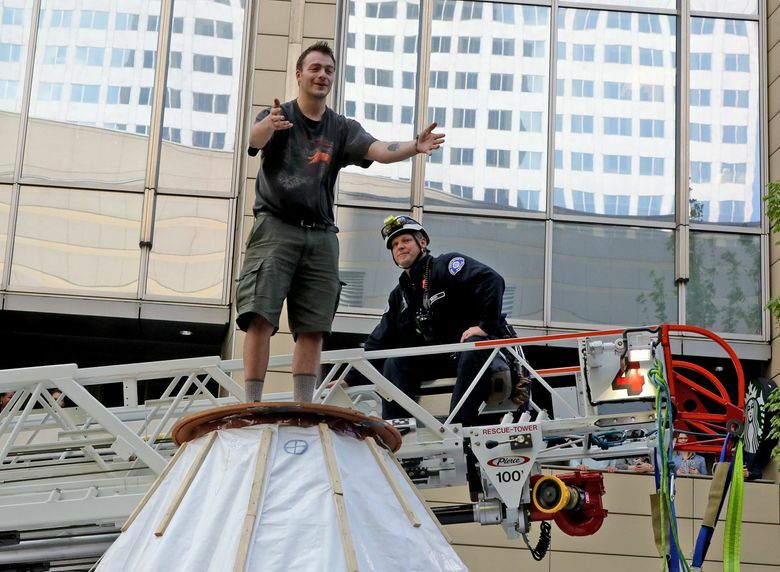 A Seattle Fire Department ladder truck extended to the top of his teepee to extract him. He politely refused to leave the teepee top, and the officer retreated. Lange continued to perch atop the tepee alongside the others, using a cigarette to sprinkle the teepee top with tobacco, as a traditional Native American blessing. Lange said he was not afraid of arrest and committed to doing what he feels he must for the planet. He had never been arrested before, Lange said, but it became time to take a stand. “You can’t do this with fear,” Lange said. 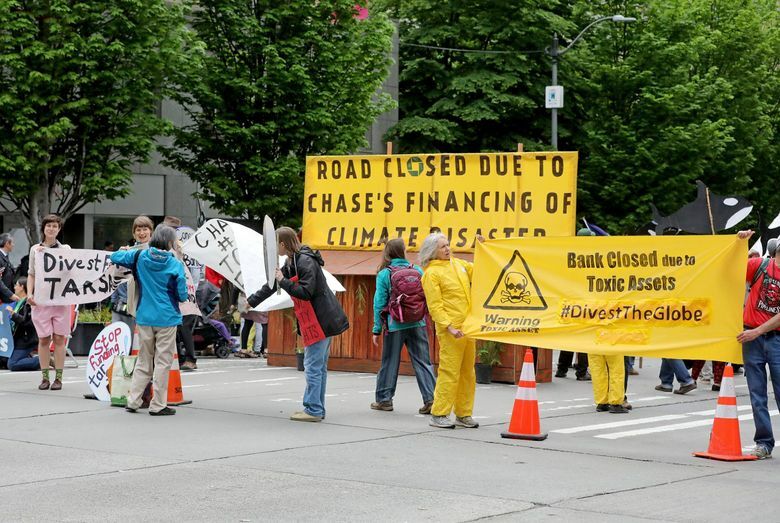 “I’m doing this to protect our children and grandchildren, the trees, the salmon and all the native species. Lange was eventually coaxed into surrendering and was taken into custody. Onlookers drummed and sang, lining the sidewalk between Union and University. 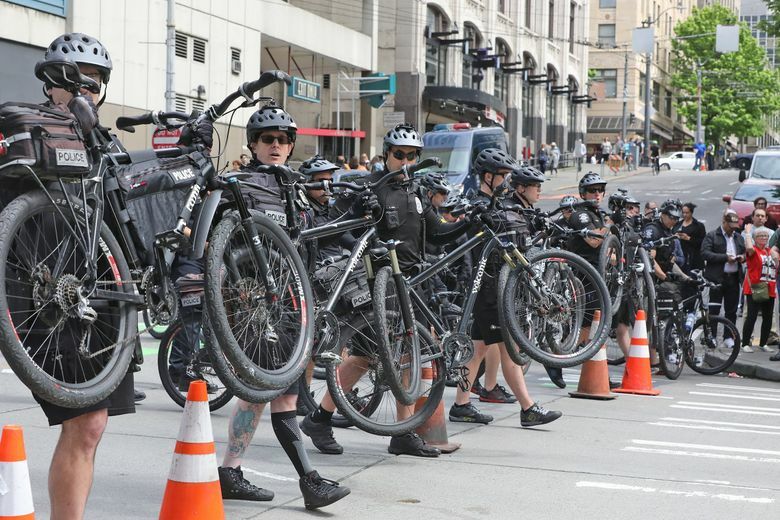 Inside the Russell Investments Center, demonstrators had heeded the order to disperse and it was business as usual with people oblivious to the action, staring at phones and laptops at Starbucks and heading into Zillow for work. Lange said he hoped he isn’t jailed for more than three days so he can get back for his Thursday shift at Chocolati. An estimated 200 people took part in the demonstration.